gave Him His way because its family members, the aquatics like the sharks, snakes, and crocodiles, were being burnt by the heat of the angry red-hot eyes of the Lord. of knowledge, they do not realize that the sentiment of the Absolute Person is transcendental to all mundane concepts of quality and quantity. Had Lord Ramacandra’s sentiment been of mundane origin, how could it disturb the whole ocean and its inhabitants? “I am the source of the devas.” (Gita 10.2) Srila Prabhupada explains that the three primal devas, or gods, are Brahma, Vishnu, and Mahesh and that Krishna is the origin of them all—even of Vishnu. Lord Ramachandra separately. By worshiping Krishna, we automatically worship Lord Rama simultaneously. must Krishna. We have thinking and feeling and willing, so Krishna must too. And we have activities, so Krishna must too. Krishna, the Absolute Truth, has everything that we have plus more—and in greater quantity. ideal wife, ideal servant, ideal ruler, and so on. and emotions—nothing.” They want to make everything zero. Thus statements such as “the red-hot burning eyes of Ramachandra” cause havoc for the impersonalists. sorry that I upset you. Please forgive me. Please rectify me.” That is the meaning of seeing others as prabhu. The same pastimes that are described here in brief, in three verses in the Second Canto, are elaborated upon in the Ninth Canto in two full chapters. The entire Ramayana is summarized in the tenth and eleventh chapters of the Ninth Canto of Srimad-Bhagavatam. And there Sukadeva Gosvami elaborates on these two points: the Lord’s being aggrieved in separation from Sita, and the Lord’s becoming angry. to lament in separation from His devotee or His devotees appear to lament in separation from Him, internally they experience transcendental bliss and actually relish the feelings of separation (vipralambha) as the highest ecstasy. Still, she wasn’t convinced. She harbored some doubt within her heart. exist, and continued searching for Sita. But from her side, wherever Parvati looked, she saw Rama, because He had expanded Himself into so many forms that wherever she looked she saw the Personality of Godhead Ramachandra. so he asked, “Did you see anything unusual in the forest?” She replied, “No, not in particular.” So he became angry—not just because she had disobeyed him, but because she had not told him the truth. And he was ready to burn her to ashes. So, Lord Ramachandra is the Personality of Godhead. He is not an ordinary person, although He appeared to lament like one. And Lord Shiva, a pure devotee beyond the modes of material nature, became angry, as was appropriate. Returning to the pastimes of Lord Ramachandra as described in Srimad-Bhagavatam: After searching for Sita in the forest and being unable to find her, He ultimately learned that she had been kidnapped by Ravana and carried to his capital of Lanka. So Lord Rama made His way to the southern tip of India, to the Indian Ocean, and there glanced over the golden city of Lanka, angry that Ravana had kidnapped Sita and thus insulted the Raghu dynasty. the holy name of the Lord once, like Ajamila, in namabhasa, without offense, one is freed from the reactions to more sins than one is able to commit. From where, then, does the suffering of a devotee come? Ramacandra, the Personality of Godhead. and to Laksmana, who have so kindly appeared in Kali-yuga as Gaura-Nitai, to destroy our sinful mentality. afternoon, Lord Chaitanya took His lunch, but the brahman fasted. fire, Agni made the illusory form disappear and delivered the real form of Sita to Lord Ramachandra. Thus the original Sitadevi was reunited with her eternal Lord and master, Ramachandra. spiritually depending on how it is used, in what consciousness. So we should be careful to use whatever facility we receive by the grace of the Lord exclusively for the Lord’s service and not for sense gratification. may become prominent, and then we may require some special mercy to free ourselves from that contamination. Krishna may take from us the object of our material attachment and remove that obstacle to our spiritual progress (yasyaham anugrhnami harisye tad-dhanam sanaih). be spiritual. Even a “negative” emotion engaged in Krishna’s service is spiritual, and a so-called noble sentiment outside of Krishna consciousness is material. service, it is real—and good. Otherwise, it is illusory. fight and kill unless you are angry? He spoke the whole Bhagavad-gita just to make Arjuna angry.” So, anger, when used in the service of the Lord, is spiritual. Anything and everything can be used in the service of the Lord, and that is the basic principle of Krishna consciousness. Because spiritual sentiments and activities can resemble mundane ones, we can easily misunderstand the Lord or His pure devotees. We may think that such transcendental sentiments are mundane, or that the Lord and His pure devotees have no such sentiments. Thus one may develop an artificial view of the Lord and His devotees. of circumstances related to Krishna’s service, he could display temporary changes of emotion. me.” So, Prabhupada could become discouraged. full range of emotions, and can be encouraged or discouraged. So, when we deal with devotees, we should always be careful—and considerate. course, Sivananda accepted the kicking as the greatest blessing. After bringing Nityananda Prabhu to His residence, he told Him, “The dust of Your lotus feet is not attainable even by Lord Brahma, yet Your lotus feet have touched my wretched body. Today my birth, my family, and my activities have all become successful.” But Sivananda’s nephew, who was only a boy, felt offended and left the group. On his own, he traveled to Jagannatha Puri to meet Chaitanya Mahaprabhu. him, and then talk of other things. and accept it. If our audience becomes discouraged—or inimical—we should feel responsible. We should think how we can improve and perhaps act to rectify the situation—by the grace of the Lord and the devotees. ourselves.” Rama had made that point. He insisted, and finally His ministers came out with these criticisms from the residents of Ayodhya. kept by His side. And so it was established that Sita was perfect in every respect. So, how are we to view the residents of Ayodhya in that position? Personally, I have a lot of harsh feelings when I see that even after Sita showed her purity in that test of fire, they criticized Rama for taking her back. Giriraj Swami: That was a very moving narration. I don’t know if I can speak after that. to have their complete support and faith. Still, where this incident is described in the Ninth Canto, Srila Prabhupada refers to those critics as rascals. He says that Lord Ramachandra, fearing such rascals, abandoned His wife, Sitadevi. We find that Sri Chaitanya Mahaprabhu also adjusted His behavior when He was criticized. When a senior sannyasi criticized Him for eating too much, He reduced His eating by half. All the devotees became upset; as it was, the Lord accepted so many austerities. and could hardly wait for the sannyasi to leave town. And when finally he did leave, they felt as if a great burden had fallen from their heads. Then Chaitanya Mahaprabhu accepted prasada as usual. Lord Chaitanya didn’t either—but sometimes they did. In India, Srila Prabhupada would be open to visitors every afternoon for one or two hours. Anyone could come and see him. But in his later years, Prabhupada’s health wasn’t that good, and he often complained that he wanted to translate more. his illness prevented him—to have open darshan every afternoon. Prabhupada to her home for a program. She had done a lot of service and really wanted to help. She invited many prominent people to the program, and after the kirtan in her garden, Prabhupada and the devotees went in the house to take prasada. elevate people, but in other ways we don’t compromise. And we have to be intelligent enough to be able to distinguish between principles that we must maintain and less important details that we can adjust. Devotee: Maharaja, can we see the residents of Ayodhya as being instruments in the pastime that Lord Ramachandra displayed? Can they be seen as parts of the Lord’s whole pastime, in which everyone was meant to take part? Lord’s grace. So, we can also see a higher arrangement. 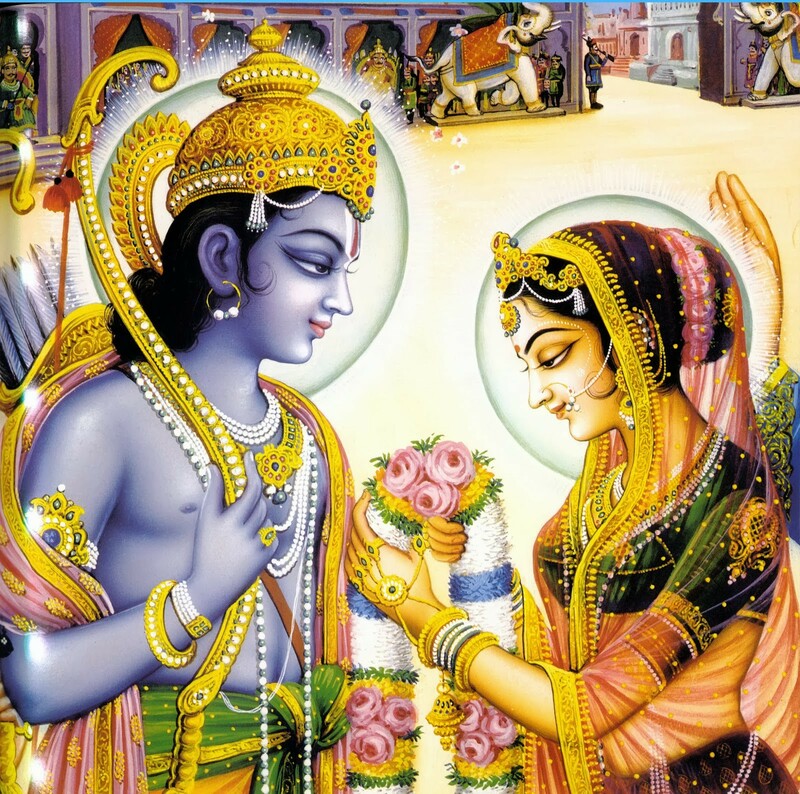 began to praise Sita and Rama again and again. It was glorious. But Rama Himself, seeing this and being separated from Sita, was devastated. “After Mother Sita entered the earth, Lord Ramacandra observed complete celibacy and performed an uninterrupted Agnihotra-yajna for thirteen thousand years. Thank you very much. All glories to Srila Prabhupada. Sri Sri Radha-Kalachandji ki jaya! Sri Sri Sita-Rama-Laksmana-Hanuman ki jaya! Sri Sri Gaura-Nitai ki jaya!